Many questions still remain about the general elections held in Serbia on April 24, mostly whether one nationalist and two liberal-quisling groups will make it past the 5% threshold and thus qualify for seats in Skupština, the Serbian legislature. Here's why none of that matters: either way, the Progressive Party and its leader, Aleksandar Vučić, will remain in charge - of executing every order and whim of the Empire, that is. Elections in a satrapy such as Serbia (or Ukraine, for that matter) are meaningless by default. They don't decide anything. Their sole purpose is to paint a veneer of legitimacy on one quisling or another. 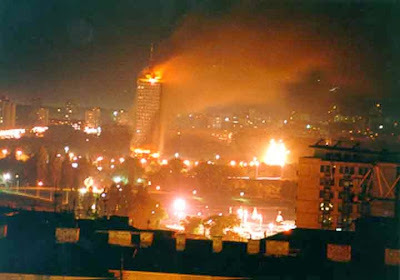 Time and again, ever since the 2000 coup, whoever the Serbians voted for they got a quisling government either blessed or directly appointed by the Empire. Time and again, such governments would obey not the will of their electorate, but the orders of their overseas masters. So what difference does it make who gets to be the quisling-in-chief? So, while the pundits debate who got a vote or two more or less than 5%, I'm going to ignore the entire sordid spectacle and pray instead for the "resurrection of the dead and life of the world to come" at Pascha tomorrow. For God is just, and His justice cannot sleep forever.